Last month, for kid’s cooking class, we tried and make Pumpkin muffins, after reading a really cute Halloween book called Somethin’ Pumpkin, by Scott Allen and illustrated by Jimmy Pickering. The book is a very funny romp on all the different uses pumpkins can have during the spooky month of October, waiting for Halloween… from a boat for Black cats to prevent getting wet, to Bongos for skeletons to play with. It’s written in verse, and suitable for small children. Even my 6 year-old had fun with it, but I think my 1 year-old enjoyed it best. Back to the muffins. Our first attempt during class was not a success; the muffins came out a little gooey and undercooked. However, as I really don’t like dropping the ball on a recipe, I decided to tackle this again and adjust proportions. So, after making pumpkin pancakes for breakfast Sunday, I used the rest of the pumpkin puree for my second attempt with the muffins. This time, the result was absolutely delicious! 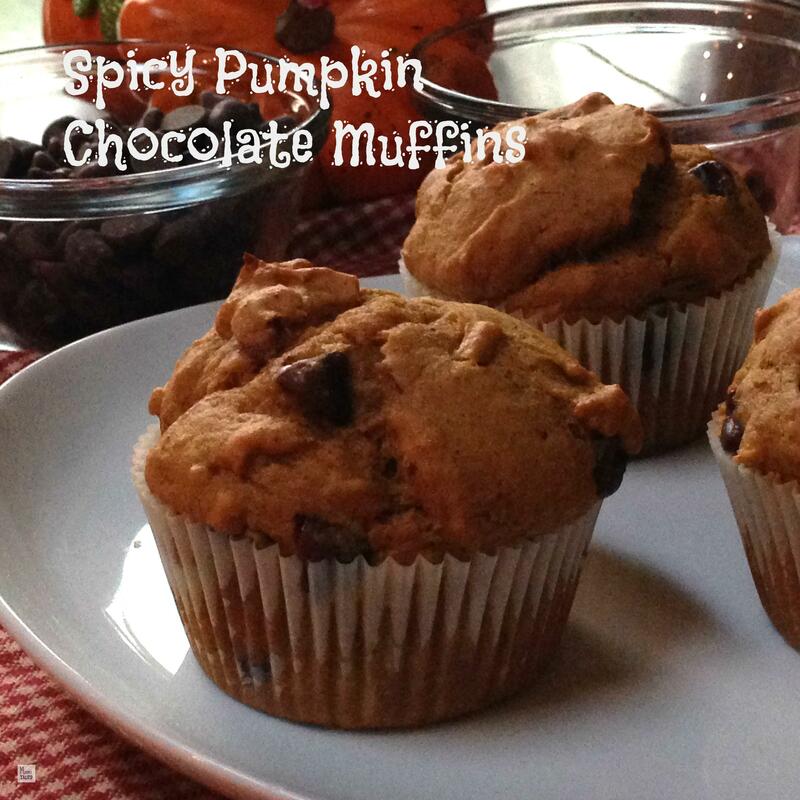 These Spicy Pumpkin Chocolate muffins melted in our mouths with the not-so-sweet but delicious dark chocolate chips hidden inside. Yum! I had to have another one before bed… then another one for snack mid-morning today… Like with gingerbread, the funny thing was discovering that the muffin tasted even better today, as the flavors and spices had had time to blend and mellow out. Even though October and Halloween pumpkins are done, I think this is just the perfect fall recipe, and will fill your house with the spice smells of Thanksgiving. Preheat the oven at 375º F with the rack in the middle rung. In a medium bowl, combine the flour, baking powder, baking soda, spices and salt, and mix well. In the bowl of an electric mixer combine the pumpkin puree, brown sugar and canola oil until well mixed. Add the two eggs and mix just until they get incorporated. Add the heavy whipping cream, and mix until you have an homogeneous mixture. Pour the dry ingredients over the liquid mix, then fold in using a spatula until it is all incorporated. Divide the batter evenly among the 12 muffin liners. Your muffin tins will be almost full. Set in the middle of the oven, and bake for about 20 minutes, or until a cake tester or toothpick comes out clean when inserted in the middle of a muffin. Let cool down in a wire rack, then serve on their own or with a dollop of whipped cream. If you don't like too much spice, you can just adjust the amounts to your taste, or use pumpkin spice instead of the cinnamon, ginger, nutmeg and cloves. Tagged Baking and Cooking, Book reviews-recipes, Cooking with Children. I love that you do cooking classes! I wish we had those when I was growing up. Kudos for you on not giving up on the pumpkin muffins! High five! So glad you enjoyed the recipe! You should definitely try them out! Thanks for stopping by. I’ve only cooked savoury with pumpkin before, and I looked for a suitabl sweet recipe, but they were all a bit blah – this is definitely not blah, it looks a great way to use the pmpkin innards! As the post says, it took a couple of times to get the recipe right, but I do recommend it now! Hope you love it as much as we did!